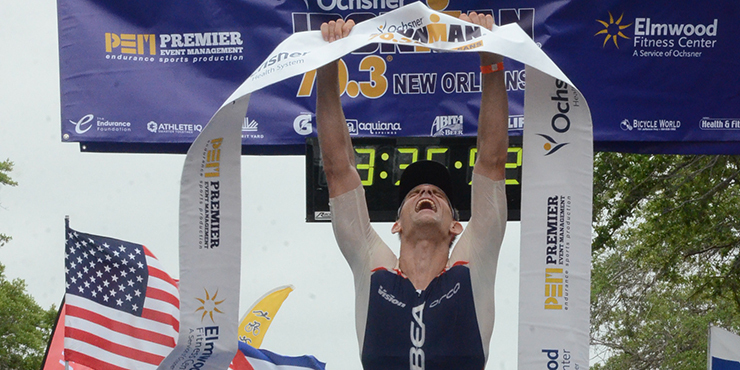 Next week I will talk about the week between 70.3 Galveston and 70.3 New Orleans, but this week we talk about winner winner chicken dinner. At a few minutes after 6am an announcement was made that the race start would be delayed because a few of the buoys had drifted, so I took a little jog over to the harbor where the swim is contained and I started laughing…All the buoys had drifted and were against the sea wall. Granted, the wind was howling and those buoys were like sails. Bill Burke’s team did a great job getting the buoys back in location to get the race off. We all jumped in the water and were lined up where we were supposed to start. Prior to the cannon, a bunch of guys started swimming laterally to reduce the length of the tangent to the first buoy. I was one of the last to start the lateral swim and as I was casually swimming over to where the self-proclaimed pro start appeared to be the air horn fired and I laughed and shook my head as about 15 of us were starting effectively 5-10m handicapped. After about 200m we elbowed around the first buoy and lined up for the straight shot along the sea wall. Then the beating began. The chop from the strong winds made the placid harbor into a bath tub. The wind kicked up waves that would bounce off the seawall, then the boats, then another wave that the wind kicked up. Waves smacked you in the face every time you tried to sneak a breath. This played huge in my favor. I swam through the entire field. 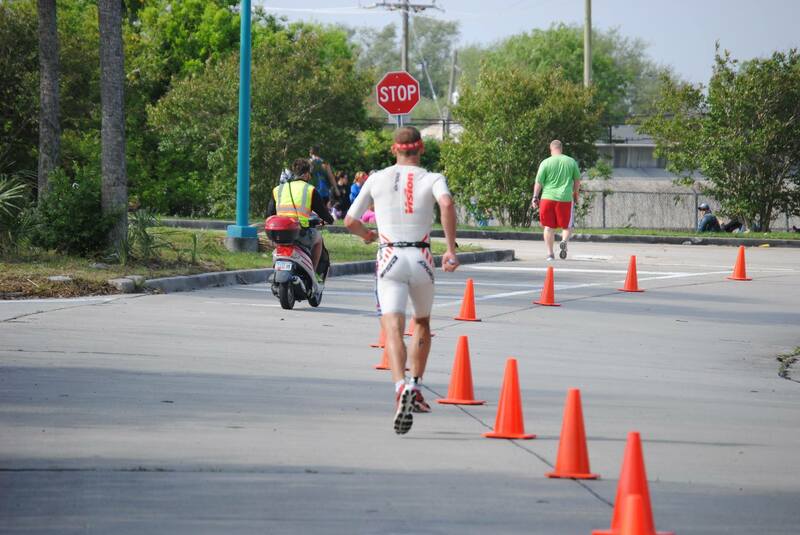 Picking guys off one by one and by the 1200m turn I was in 2nd chasing down the lone leader who had about a 30m gap. Well I don’t know what his gap was on me but I could see the lead kayaker…occasionally. 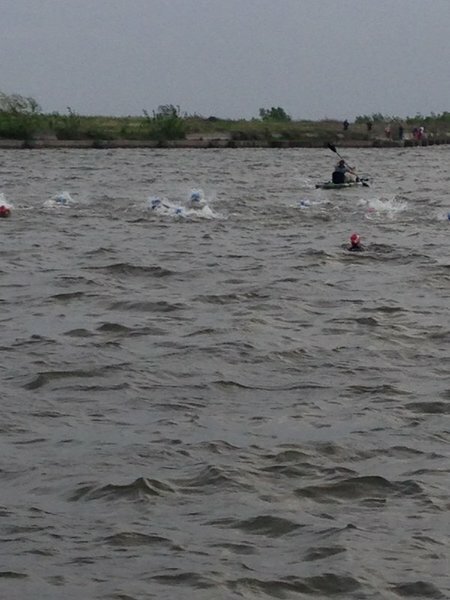 Finally the final buoy and as we got out of the water another athlete sprinted around me to beat me out of the water. Again I was shaking my head thinking he must not have known that there was somebody 30-40m ahead. In the run to transition I learned the lone leader was the ever dangerous Matt Chrabot. As I mounted my bike and the wind howled more than ever, I grinned ear to ear and revved my engine. Within the first 5k of headwind Matt’s lead was wiped out and now it was time for me to put as much time as I could in the 40km to the turnaround. I turtled down deep into an aero tuck and let the legs scream sacrificing a few Watts for a lot better aero position. The wind gusts we gnarly coming off the bayou. Some tried to throw my bike across the road others literally lifted the helmet off my head, but they all made it very difficult to feed. It took me 1:05 to get out to the turnaround, I chuckled because a 2:10 bike split was the standard 10 years ago…my how times have changed. Now it was tail wind time. I shifted around in the saddle, I moved into a position that I could generate max power. The gap back to the first two chasers TJ Tollakson and Chrabot was already 3 minutes, then it was a while back to the first of a few smaller packs of riders. Hammer time, and 100% focus on not crashing as the gusts were now largely at my back pushing speeds well over 35 mph. Now every little pavement seam acted as a launch ramp on what had become a high cadence threshold ride. I went through the hairpin at mile 55 and got 1 last taste of headwind, ufff. 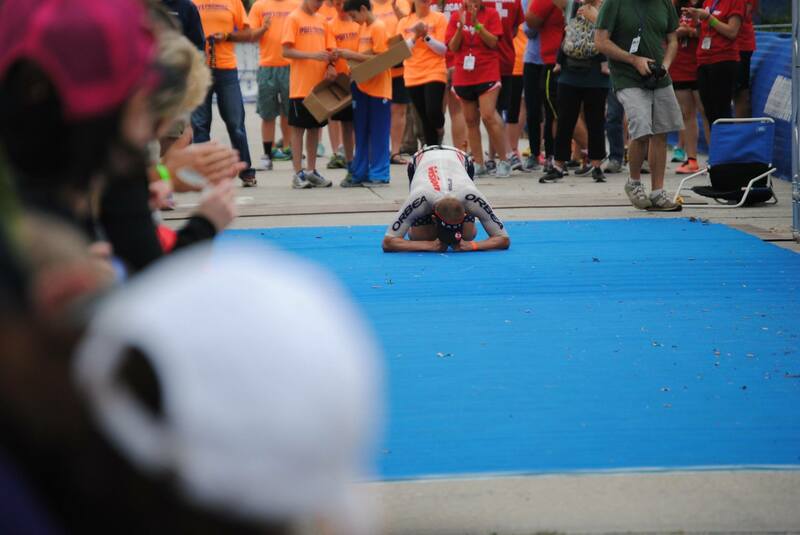 As I rolled into transition my legs were spent and I hoped had the strength to generate a winning run split. Time to run and the run course here was my favorite, straight out, turnaround, straight to the finish. Only 1 chance to measure your competition. I ran really well on the way out, I felt like my legs were just unraveling under me. I just kept hydrating and clicking off the miles. Finally the turnaround, now let’s see the gap. Holy cow, no worry about the gap, how about a massive head wind. It was so consistent and strong that you were actually able to lean into it like running up a hill the entire way home. Back to the gap, nobody immediately, tap, tap, tap went my feet and tic toc went the clock. I ran and ran, I was in sight of the mile mark and I saw Taylor Reid and Matt running together, a full mile behind and they had daylight back to everyone else. The lead was big, but I have watched a lead like this melt away in 6.5 miles, Lionel did it to me at 70.3 Racine, Del Corral at Ironman Florida. I kept the hammer down. At mile 11.7 you crest the channel to the Mississippi River from Lake Pontchartrain and the gap was still immense. A smile crept across my face. It was as much a celebration as a relief. 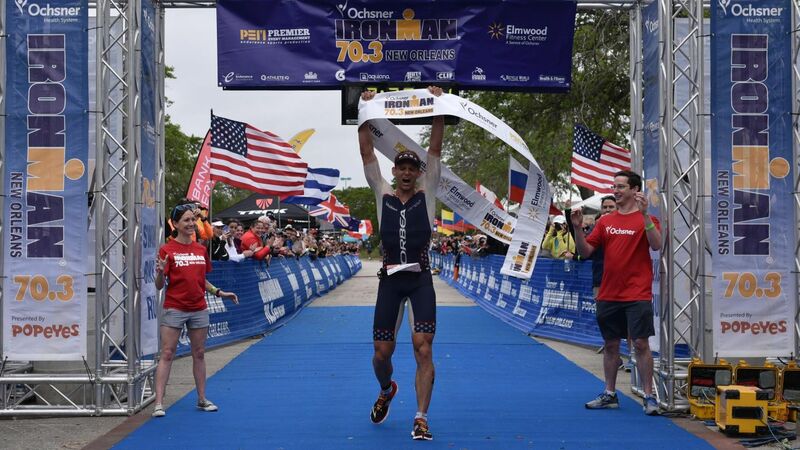 For the 1st time in 22 months & for the 2nd time in my career on my birthday week (2014-70.3 Puerto Rico) I was able to hoist the finish line banner and declare victory. I went back to the finish line said my thank you’s and that is when the cramping fun started, my hamstring locked, I engaged my quad to straighten out my leg it cramped. I was done and so was my body. It had been a long time and I am enjoying this one because you never know when the next one will be! 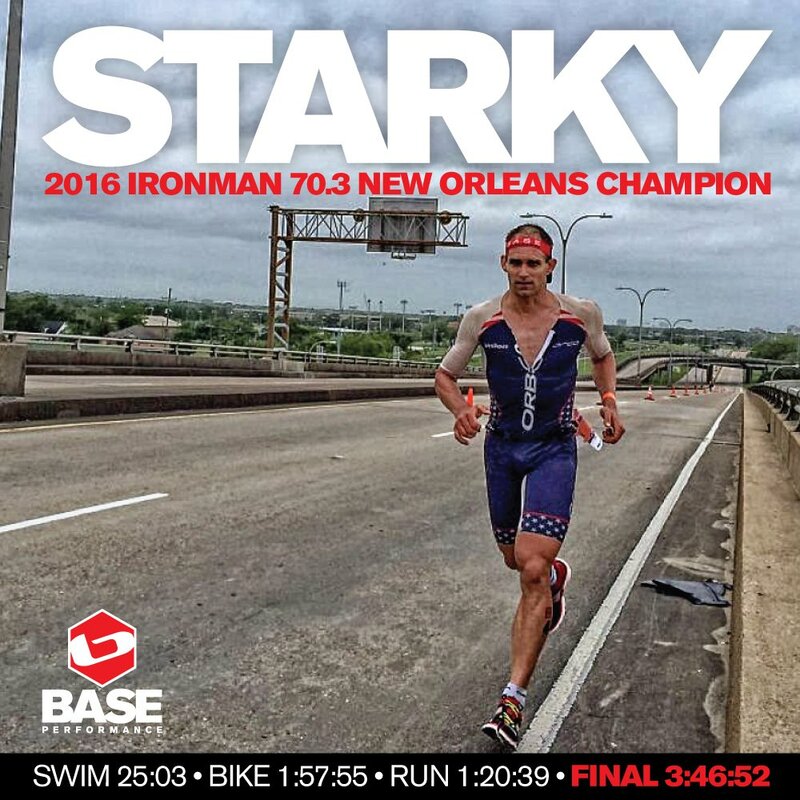 Way to go Starky! Awesome victory!